I turned to Jane Brocket's The Gentle Art of Quilt Making for a little guidance on how to best work with the mix of small and large scale floral prints in the latest fabric range - Loulouthi - by Anna Maria Honer. I have previously mentioned this book - here - and have browsed through at leisure numerous times, enjoying Jane's words as well as an overload of quilt and fabric mix inspiration. This time around I spotted the Beach Huts design shown in two distinct colorways, and used this as a starting point for my own selection of fabrics including the bundle of Loulouthi that arrived just yesterday. Using large scale floral prints and getting together the right mix of fabrics is definitely the trickiest part in making this quilt top and there were plenty of moments of doubt. I have selected numerous (but not all prints) from the Loulouthi collection as well as several classic prints from stash - mainly geometric prints (spots/dots and squares). I found myself stepping further and further back when checking progress on my design floor space, even having to walk away and return with a fresh perspective a little later. It is bright and colorful, and I have found it difficult to capture the feel and overall aesthetic of this quilt top in such a small image. The black and white spot really works Rita! Closely followed by the red and white spot :) Just the right amount of pepper in a very lovely quilt. I think it's an excellent mix. I can't believe that in 24 hours you had time to do all that cutting and sewin AND had time to walk away and return! Gorgeous quilt! I just love Jane Brocket's book! What a fabulous design for this collection of fabrics. Just beautiful! The large dot fabric is very dominant and moves your eye around the quilt jumping from dot to dot. Just beautiful. I love the pop the black dot adds to the quilt! 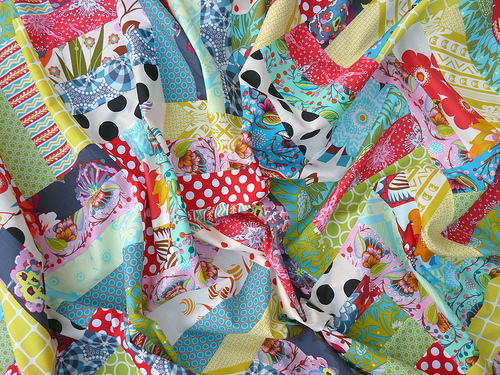 Stunning Rita - what a great mix of fabrics! Gorgeous quilt! Love the red, it makes everything pop, makes it much brighter. Well done! I agree - the dots & geometrics really work nicely! You really do have a fantastic eye for what works! Looks great love bright colors! What a great fabric selection you've chosen for this quilt. I find such choices very hard myself, and I have the quilts to prove it! It's amazing how some fabrics stand out in a restful way, esp the black dots and green with white squares - is it because they are different from everything else? You amaze me, truly! Can not wait to see it finished!!! It's beautiful! I love the colors and fabrics! It's lovely. My kind of fabric mix. My kind of simple pattern. Another winner! Wow I am seeing spots before my eyes - gorgeous ones and lots of other eye candy! Beautiful! From such an interesting mix of fabrics! Wow-this turned out great. I love the bright quilts and you did a good job with color arrangement. Rita, I can't believe how fast you work! Its beautiful! Love it! How do you do it so quickly? 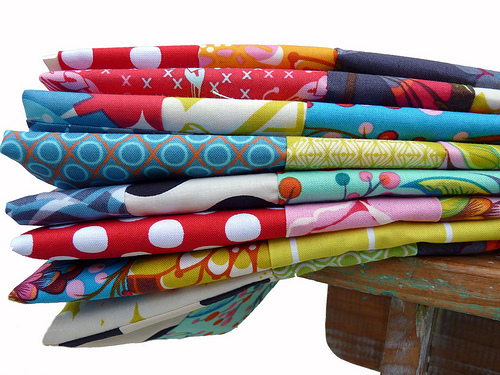 You have a great knack for getting just the right mix of fabrics Rita! Love love love Jane Brocket's book. The first quilt book I purchased when making my absolute first quilt and it has been a wonderful teacher to me. Many of her quilts are to bold for me personally but I love how the book is written, illustrated and designed. Just a great book! 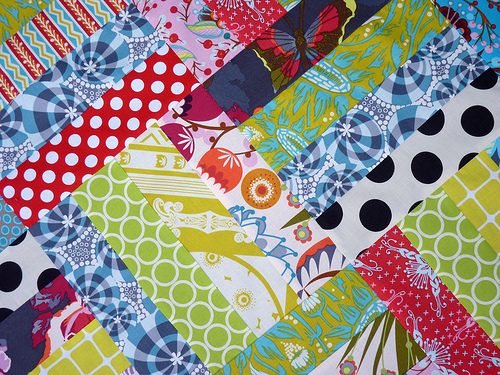 And your version of the Beach Hut quilt is fabulous. I also tried out that pattern for My Brother's Quilt that I made around Christmas and I doubted myself at many occasions during the process. I even put away the quilt for weeks just to get some distance to it all. Not until the quilting and binding was done I could breath out and feel the satisfaction setting in. This one is going to be a wonderful one. I am sure. And I agree with above comments, how do you manage to cut, plan and piece all that in just 24 hours? Amazing! Lovely job with tricky fabrics. I think that black and white dot is a key piece in grounding the eye and giving it somewhere to rest among the flowers. 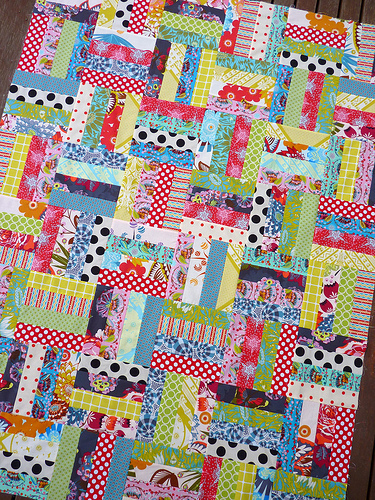 Such a bright and happy quilt. I love it.